A pretty precious piggy bank for your playful princess! 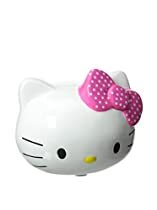 The new Piggy Bank from Hello Kitty® is a molded ceramic bank with glossy finish and a plastic coin stopper. **Please note: This item is a Choking Hazard, NOT meant for children 3 and under, as choking or entanglement may occur. **Please note: This item is a Choking Hazard, NOT meant for children 3 and under, as choking or entanglement may occur.